SkyShapers is our very own online game in-development, which we continue to dive into when we have the time. This page shows off a few of our early prototypes in-development, which illustrate the basic gameplay. The goal of the game couldn't be simpler: you just need to reduce the darn pollution, which is doing all kinds of funky things to the climate... Unfortunately, this task is complicated by the thick, filthy smog that seems to just rise relentlessly from the bottom of the screen, as if it will never stop. Your jet-powered albatross Sky determined to solve this with good intentions, but his dirty engine only makes matters worse. It's up to you to find solutions to all of this fast, before the smog catches up with you! This early prototype for SkyShapers provides a fun, interactive glimpse into one among several potential visions for the future game. Click "How To Play" for detailed instructions on gameplay, or see the image below. 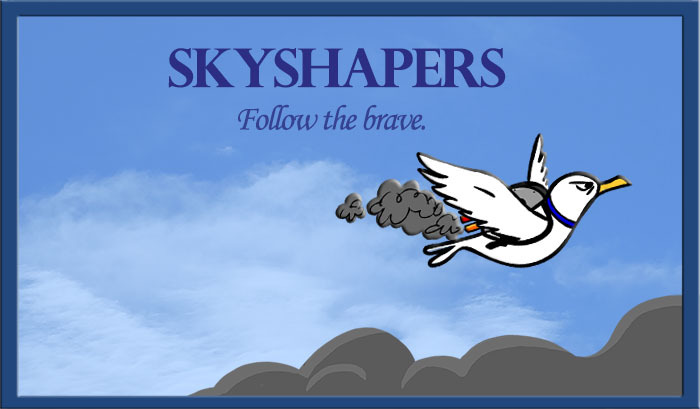 When you're ready to go, click "Play"
Animated flight cycle for the game's intrepid hero, "Sky Shepherd"